Hey everyone! I hope everyone had a great weekend! Mine was busy as usual but good! I have my splatter mani for you today. This is a simple mani! My base color is green and I stamped with green. 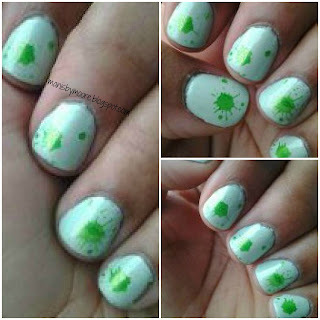 Since St. Patrick's Day is coming up I thought it would be fit to throw some green this mani! I am only missing some gold! I know this is short and sweet! I hope you like this mani! Do you like splatter manis? Thanks for stopping by!